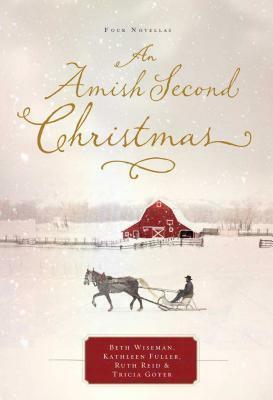 My review of “An Amish Second Christmas” by Beth Wiseman, Ruth Reid, Kathleen Fuller & Tricia Goyer | Stop #6 of my Salute to Christmas Reads! I’m not sure I can really do justice to how truly amazing these authors are! Beth Wiseman writes a very different kind of story in this book. Even reading the synopsis, I was not prepared. It was intriguing and interesting and a story worth reading. Kathleen Fuller has written a wonderful story about love and how it deals with boundaries. Tricia Goyer has told us another wonderful story of the Kootenai Amish. It’s always fun to read about those wily bachelors and the women they woo – even more so when there’s pie involved! Each story in this book is an amazing story and a wonderful look at how the Amish celebrate Christmas… or more specifically, Second Christmas. Her Christmas Pen Pal by Ruth Reid! I was in so much trouble with my daughter AND my mother because I WOULD NOT put the book down until I had finished reading! I laughed, I felt like crying, I gasped in shock and I cheered! I have read Ruth Reid’s writing before but I have to say that this is by far the best thing she has ever written! And I really… really really hope everyone loves it so much and she writes a whole series on it! Because I’m just DYING to know more about the characters! And that is the mark of a GREAT book in my opinion. I was actually sad when I turned the last page! Of course I had two more stories to read so it was a tiny bit of a consolation but I WANTED MORE OF THAT ONE! And now I’m chomping at the bit for Ruth’s next book to come out! Celebrate Second Christmas, a treasured, lighthearted time of community, with four Amish romances. Joy was expecting a wedding proposal from Henry; what she got instead was news of another woman. But when her heartfelt letter to a cousin ends up in the hands of a young cabinetmaker, an unexpected correspondence between two strangers gets interesting fast. Anne Marie and Nathaniel have been best friends since they were kids. Now things are evolving . . . in ways everyone else predicted long ago. But when her mother suddenly decides to remarry in another state, Anne Marie’s new chapter with Nathaniel looks doomed to end before it begins. Vanilla crumb pie has been Esther’s mem’s calling card for decades. But when Esther finally gets her hands on the secret recipe, she discovers that vanilla crumb pie is more than just dessert . . . it’s bachelor bait. Next > My review of “Christmas at Rose Hill Farm” by Suzanne Woods Fisher | Stop #7 of my Salute to Christmas Reads!